2019 marks the end of the Highmark/UPMC Consent Decree. In simple terms, Highmark and UPMC will no longer share the same network*. Highmark members with UPMC doctors or services will either need to switch to Highmark providers or pay Balance Billing. Please see below for resources to determine what your best options are. Call your doctor(s) to ask if they are in network. If not, ask for referrals, or register for Meet Dr. Right on December 5, 2018 and chat with in-network doctors, make appointments and get health screenings. 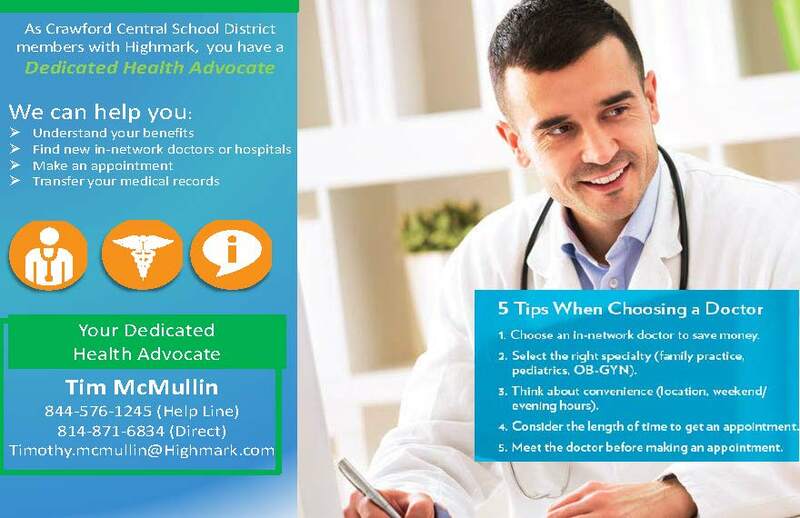 Call your dedicated Health Advocate, Tim McMullin, Help Line at 844-576-1245. Call My Care Navigator at 1-888-BLUE-428 to talk to a customer advocate OR find a doctor. Search for doctors, hospitals and other health care providers. Read what other members say about network doctors. See how doctors rank based on national guidelines.